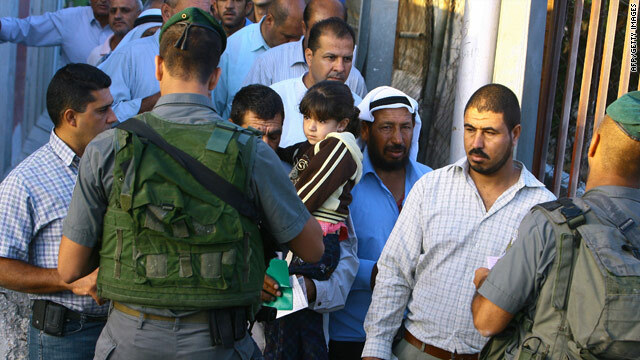 Palestinian Muslims show their IDs at an Israeli army checkpoint in the West Bank city of Bethlehem on August 13, 2010. Jerusalem (CNN) -- Israel will deploy 3,000 police officers in and around Jerusalem to prevent any outbreak of violence as Muslims gather for the first Friday prayers for the holy month of Ramadan, police said. The emphasis will be the Old City of Jerusalem, said police spokesman Micky Rosenfeld. The deployment is aimed at preventing violence around the Al Aqsa mosque, which has been a flashpoint of past clashes between Israelis and Palestinians. There will be no restrictions to enter the compound around the mosque, Jerusalem police spokesman Shmulik Ben Rubi said. The compound is known to Jews as the Temple Mount and to Muslims as Haram-al-Sharif. There are, however, certain restrictions on Palestinians entering Jerusalem from the West Bank, Israeli police said. The restrictions apply to all men younger than 50 and all women younger than 45, Rosenfeld and the Israel Defense Forces (IDF) said. There are no restrictions on Israeli Muslims, the IDF said. In March, dozens of people were hurt during clashes around the mosque and police used tear gas and rubber bullets against protesters. That violence was sparked by anger at Israel's decision to place two religious shrines in the West Bank on a list of Zionist heritage. The following week, Israel sealed off the West Bank and tightened security around the Old City after authorities announced controversial plans to build new apartments on disputed land. Israeli police also restricted worshipers from entering the mosque for Friday prayers. There were also several arrests at the holy site in February and last October. In 1996, dozens of people were killed in rioting at the mosque. CNN's Paula Hancocks and Michal Zippori contributed to this report.